Puno was looking for his next opponent. His next challenge. 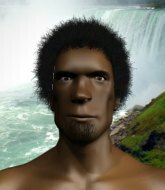 Many thought it would be Musketqueer fighter Soa Palelei. Some thought a rematch with heavy hitting France fighter Obelix De Gaul was warranted. And many people have been clamoring for a showdown with Gerbert Bryant who's been gaining a lot of weight eating hype from GAMMA cans. As fate would have it, none of these fights would materialize due to a series of predictable circumstances. Obelix De Gaul did what the French do best and tapped out. Soa Palelei did his best impression of Bob Sapp and took a dive. Meanwhile the #5 P4P fighter in the world and #1 ranked Super Heavyweight fighter, Gerbert Bryant, is too busy chasing WWE-style mismatches in B-list talent pool organization GAMMA. Puno had a lot to think about. Jean Pierre Garcon threw his name in the mix but Puno was 2-0 vs him and beating him a 3rd time would do nothing for his legacy. Bryant seemed like a logical superfight but was too busy chasing the canned food he was being fed at GAMMA. He was 13-7 when he signed with the Mentor-lead organization, and he's undefeated against GAMMA level talent, his only loss coming to a Convicted fighter from Syn' who proved to be in a different league. Bryant put on a pathetic display vs Gymer Alexandersson, hugging his leg for dear life for 5 consecutive rounds in a decision loss and put on one of the most boring displays of mixed martial arts in Heavyweight history in his defeat. 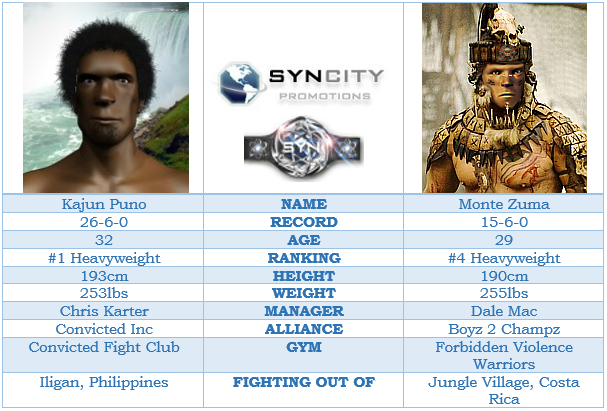 Puno gave a hard look at Monte Zuma, the #4 HW sporting a 15-6 record that just upset Obelix De Gual in a SHW title fight. ODG was French. Him tapping out and surrendering the victory to his opponent was something that runs thick in his genetics and ancestry, and despite it being the first official submission loss on his record, it was long overdue. Puno wanted to challenge himself. He wants to prove to the world that he's the best Mixed Martial Artist on the planet. He's laid waste to many high-level strikers on his run to the #1 headband, but he hasn't faced any high level submission specialist. It became clear that Monte Zuma, a black belt under Ramiro Hamilton, posed the biggest challenge from a technical standpoint. Is it the fight everybody wants to see? No. Is it the lightning meet fireworks meet dynamite stand & bang fest the crowd loves to see? No. Does anybody know who Monte Zuma is? No. But it is a true Mixed Martial Arts fight vs an opponent with a very different dynamic and technical threat than Puno's previous opponents. Puno hasn't faced a high level grappler in an MMA fight since CFC when he took on Samir Lemaitre, but Puno, confident in his own ground game, doesn't feel threatened by his next opponents high level BJJ or the fact he submitted ODG. "He earned title fight when he won super heavyweight title." "My job and obligation as Syn' champion to defend title vs all challengers." "Been awhile since I face a true grappler. As true mixed martial artist, I feel it poses a challenge and threat I haven't had to prepare for in long time." "Last opponent that grappled, Jean Pierre Garcon, a purple belt. He should know better, Puno could of smashed face but decided to display Jiujitsu and teach lesson." "Zuma is high level BJJ specialist in the cage. Dangerous on the ground, without doubt. But I am high level grappler and brown belt under Pluto Palhares (I used to be black belt, but they take away from me when I decide to punch people in face more)." "He is first person to submit ODG, but ODG is France fighter, and he did what his countrymen do best, surrender." "I compete in TWGC. I submit red belt, I submit black belts, I am silver medalist at TWGC tournament. I can't wait for him to dive into guard and I get to remind the world of submission ability." TOTT added, credit to GBK. Man if we could get the TOTT updated to look similar to that one it would be so sweet! with a serious case of montezuma's revenge in his pants after he gets demolished. and Puno counters with a right hand from hell and Zuma is out cold! A vicious knockout! Ladies and gentlemen, after 2:51 of round 4, we have a winner by way of KO (Punch). Kajun Puno! Kajun Puno retains his heavyweight title! Kajun Puno bigged himself up after the win. The crowd seemed to love it. Puno shouted to the crowd, "Never try to grapple on me! Never hug on the Goat without permission!" "After 30 second staring contest I think he lulled me to sleep with his juju. He punch like girl. I woke up in time to get easy knockout." Syn Supernova VIII - Who Do You Want To See?